Ester Boman was a pioneer in educational reform. In 1909 she set up Tyringe helpension, a boarding school for girls. Ester Boman was born into a well-to-do home. Her father, Lars-Erik Boman, was a chief engineer and managing director with academic qualifications. However, Ester Boman lost her father to tuberculosis when she was only six years old. Despite the financial difficulties which arose after her father’s death, both Ester Boman and her sister Märta, who was two years her senior, completed their foundational schooling at Elementarläroverket in Falun. In 1895 Ester, her mother and her sister moved to Stockholm, where she continued her studies. She took courses in four subjects at Stockholm Borgarskola, and in the autumn of 1895 she enrolled at Ateneum for girls. Having completed two terms at Ateneum she became employed in 1896 as a primary school teacher at Sofi Almquist’s co-educational school. 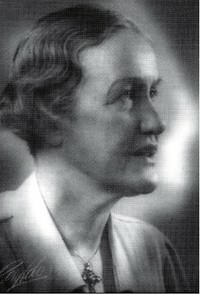 Ester Boman was employed at the school for six and a half years. One of her fellow colleagues there was Ester Östrand, whom she later co-founded Tyringe helpension with. The years she spent as a schoolteacher appear to have been significant for Ester Boman’s continued pedagogical development and her future career. In a speech she gave over thirty years later she affirmed the great importance of Sofi Almquist as her role model. Ester Boman, just like Sofi Almquist, based her pedagogical outlook on individuals and their inherent differences. During her time as a schoolteacher she began to forge international contacts by travelling to Oxford in the summers of 1899 and 1901, where she attended summer schools to learn English. In December 1902 she applied for a three-term sabbatical due to poor health. Sofi Almquist not only authorised this application but also provided an excellent recommendation. Ester Boman never returned to Sofi Almquist’s school. Instead, in 1904, she enrolled at Kungliga Högre lärarinneseminariet. Both as a teacher and during her continued education Ester suffered from health problems and she was examined on several occasions by Doctor Ernst Westerlund at Enköping, with whom she maintained contact. After passing her exam in 1907 Ester Boman moved from Stockholm to the Småland town of Vimmerby, where she spent two academic years working as an ordinary teacher at the state co-educational school. Despite spending such a short time in Vimmerby, she managed to set up a local association for female suffrage in 1908, inspired by a talk by Lydia Wahlström. In 1909 Ester Boman took another sabbatical and left the state co-educational school in Vimmerby in order to establish Tyringe helpension with Ester Östrand. By choosing a small locality, Tyringe just outside of Helsingborg, they avoided competition from girls’ schools in larger towns and cities. They borrowed money from Ester Östrand’s mother and managed their finances by charging their students high annual fees. This meant that the majority of the students were from wealthy backgrounds. Initially, the number of students was low, but it grew consistently. After a few years, the school moved first to Alingsås and finally to Hindås, 30 kilometres east of Gothenburg, where it continued to expand. The number of students rose from just eight to 80 during the first ten years. After that, the number varied between 80 and 100 until the school closed in 1936. The pedagogical approach at Tyringe helpension was characterised by concentration, outdoor life, self-directed learning and self-management. Concentration implied focus on a limited number of subjects that were studied separately and could therefore be given more time. It was also considered important to combine practical and theoretical approaches. This combination of the practical and the theoretical took the form of the many aesthetic teaching methods used at the school. Outdoor life involved trips and excursions but also included outdoor teaching. Self-directed learning and self-management meant that the differences between individuals were emphasised at the school. In tandem with running the school, Ester Boman continued her activity in support of the women’s rights movement. Upon the introduction of general and equal rights to vote the Tyringe teachers led a campaign on her behalf and she became elected local councillor. Ester Östrand stopped working in 1921 after she got married and she was succeeded by Eva Södergren, who came to live with Ester Boman and several others in the teachers’ residency that was built in the early 1920s. During the later years of the school’s existence, Ester Boman wrote a book called Uppfostran genom undervisning, which summarised the basic educational outlook at Tyringe helpension and its practical application across various subjects. During her 27 years as a teacher, schoolmistress and head teacher at Tyringe helpension, Ester Boman also continued to undertake study trips. The inspiration she gained from, for example, the philosopher and educational reformer John Dewey is apparent in her pedagogy. She was also inspired by people closer to hand, such as Sofi Almquist, Ellen Key, Ernst Westerlund and Anna Sandström, all of whom she had met during her time in Stockholm. It was Ester Boman herself who decided to close Tyringe helpension in 1936 and it came as a great surprise to teachers and students alike. Some of the reasons she gave for the closure were the 27 years she had spent running the school, the fact that she was nearly 60 years old and that she wanted to reduce her work output. After closing the school, Ester Boman moved back to Stockholm, where she continued to teach. Ester Boman taught on various training programmes, was an active member of Kristliga föreningen av unga kvinnor (KFUK) (Young Women’s Christian association) whilst also temporarily working as a teacher for Alva Myrdal on the national education programme from 1941 to 1943. She took her final study trip to Switzerland in 1946, in the company of the child psychologist Carin Ulin, whom she had come to know through KFUK. In Switzerland, she heard Jean Piaget give a talk and attended his fiftieth birthday celebration. The following year Ester Boman died aged 68. Ester Katarina Boman, www.skbl.se/sv/artikel/EsterBoman, Svenskt kvinnobiografiskt lexikon (article by Emil Marklund), retrieved 2019-04-25.